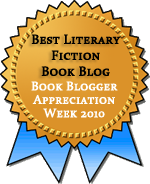 For me, this blog is as much about keeping a record of my reading to serve as a memory aid as it is about sharing my reading with an audience. (Not that you dear readers aren’t lovely, but I don’t like that so many of the books I read in my 20s fell right into a black hole.) Never is the memory aid purpose of blogging more evident as when I write about yet another installment in a long series. 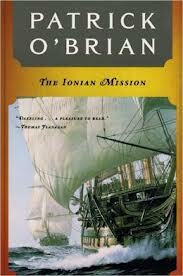 The book in question today is The Ionian Mission, the eighth in Patrick O’Brian’s Aubrey-Maturin series of sea-faring novels set during the Napoleonic Wars. What can I say about this book that would be new to someone who has been following my posts about the series? Not much. It’s a good book, but not a favorite in the series so far. It contained some wonderful character moments and amusing incidents, typical of the series. It’s a little slower than the other books; part of the point of the story is to demonstrate how tedium wreaks havoc on a person’s morale and even health. But on the whole, you could read just about any of my posts about the series to get a sense of what these books are like and how I reacted. It’s an O’Brian book, and I got what I expected out of it. So I must turn to the memory aid portion of my post. What kinds of things would I like to recall about this book? What are the “this is the one where …” moments? Well, this is the one where Captain Jack Aubrey is sent on the Worcester to the Mediterranean to assist with a blockade of the French fleet. Stephen Maturin, having settled into a seemingly contented but unconventional marriage to Diana, almost misses the ship’s departure to Plymouth. Diana has, to my surprise, is determined to see that Stephen has all he needs at sea. She’s given him a fine but wholly impractical dressing case and more shirts than he’s ever had when setting sail. In Plymouth, there’s a wonderful bit of business in which Stephen declares that a man who’s been pressed into service and terrified of losing his business is unfit to sail because of his health. Jack obtains some cheap gunpowder that causes the cannons to emit colorful explosions when fired. Jack is annoyed to be taking a group of clergymen as passengers, although it turns out that one of them, Graham, is actually a moral philosopher. This leads Jack and Stephen into some lively banter about the difference between moral philosophers like Graham and natural philosophers like Stephen. Could one say that Stephen is an immoral philosopher and Graham an unnatural one? Stephen befriends Graham, only to lose his good will when he pranks him with some fake nautical terminology. Another potential parson friend for Stephen, Martin, is enthusiastic about naval service, despite Stephen’s warnings about its harshness. Seeing naval punishment in action finally dampens Martin’s feelings. The blockade is unbearably dull, and it’s taking a toll on Admiral Thornton, who is in command of the blockade ships. Stephen goes off on some spying trips, and Jack nearly gets into a couple of much-desired skirmishes during some brief missions away from the blockade. To alleviate the boredom, the men on the Worcester prepare a production of Hamlet, but the spread of mumps gets in the way. Many of the men are terrified that, not having had mumps as children, they’ll be rendered impotent now, and Stephen reassures them that eunuchs experience great peace of mind and that “very little time is spent in coition” over the course of a lifetime. It doesn’t help, much to his surprise. Speaking of which, there’s the return of the Surprise! And Jack eventually is sent on the titular mission to the Ionian Sea, where he is to forge an alliance with one of three Turkish Beys. One of the Beys is unhappy with the result, and a vicious battle ensues and closes out the novel. The standout moments for me were the smaller incidents, like the poetry competition and the oratorio costumes and the banter. The book is filled with little moments that break the tedium of the overall story. That must be what blockade life was like. You sit and wait for action, have some near misses, and wait some more. The men aboard ship had to create fun for themselves, and thus for me, the reader. I love hearing my husband talk about the characters from this series, but I can’t bring myself to start such a long series! I love a good, long series, but I know what you mean about finding it daunting! Sticking to a vague sort of schedule (every over month with these) helps me get through the series without inhaling it all at once–although series binges can be good fun. Oh, honestly, I’m going to have to re-read this series (again.) Hearing about your experience is such a joy. Stephen, being the “experienced” nautical man that he is now, lording it over Graham! Oh ha ha ha ha ha! I can see already how rewarding rereads would be; getting to know the supporting cast would be particularly wonderful. Of course, Stephen did get his comeuppance when he decided to go for a swim later in the book. Not so clever there!